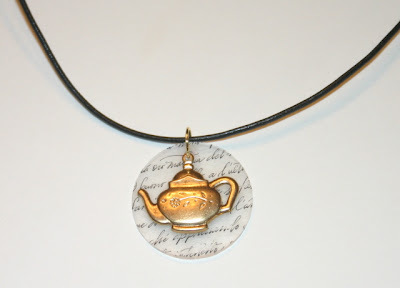 One day, I visited the creative blog of Frivolitea (who has posted kind words on this blog), and I observed this talented tea lover had made some great pendants, some featuring teapots, some a handwriting design. Would she possibly consider combining the two elements? I'd read she was preparing for a craft fair, but did she sell via mail or an etsy shop? Well, I am thrilled to report she was more than gracious in agreeing to make a pendant for me. When it came it was even nicer than I'd expected, with a very substantial cord and high-quality clasp in addition to the themed pendant I'd wanted. If you're interested, watch her blog for she says she'll be posting about how to purchase her designs in the near future. And, her photos of the jewelry are much nicer than mine, but then I never claimed to be a photographer. Just an aspiring novelist! Now here's a first. 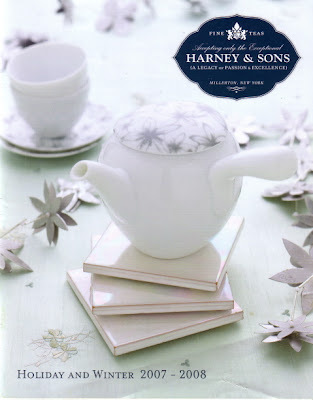 Unless I'm mistaken, this is the first time I can ever remember seeing this type of teapot, a Japanese kyusu teapot, on the cover of the Harney & Sons tea catalog. "Great for brewing senchas, but it will work with any tea," says the blurb. But you know what *I* want? It's that cute little (was it 2-cup?) silver teapot they had a few years back that sold out almost immediately. Ah, well. 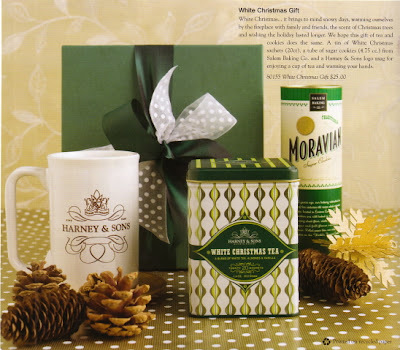 If I hadn't bought gifts from so many tea vendors already, I would be inclined to purchase the "White Christmas Gift" on the back cover of the new catalog. 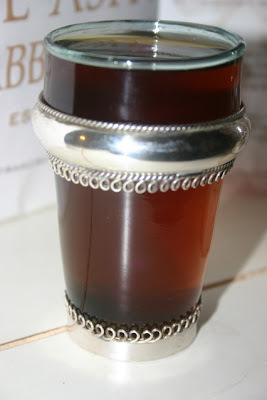 This White Christmas Tea is "a blend of Mutan White tea with vanilla, almond and cardamom flavors. The tea is accented with white chamomile flowers." I don't really need any more tea gifts, but I would like some of this tea myself to enjoy over Christmas. Have any of you tried their White Christmas Tea? I'd love to hear your review. In fact, anyone want to recommend ANY Christmas tea you've tried and enjoyed? I've been perfectly happy with the Celestial Seasonings Christmas blends, and one year I found Stash Christmas Eve and Christmas Morning teabags which I tucked into Christmas cards for tea friends. Anyone else? This is it for the year. I'm out. Alllll teacupped out. But the day I got my Christmas bonus at work, I found this vintage jewel and took it as A Sign. Where am I going to put it? Well, I'm actually sipping tea out of it these days, but a little reorganizing of the tea cabinet and I can always squeeze in another teacup or two. This is the time of year when my crafting urges are most strong, so it's no surprise that in 24 hours I've swung from sugar cookies to quilting (I came across a new quilting mag with a teapot/teacup quilt pattern) to knitting. But the knitting is the craft that actually spurred me to action, because I'm always looking for something fairly mindless to work on while watching TV on these cooler evenings at home. Yesterday in the mail I received a review copy of the new book "Tea Cozies" which the good people of Sterling Publishing were kind enough to send. 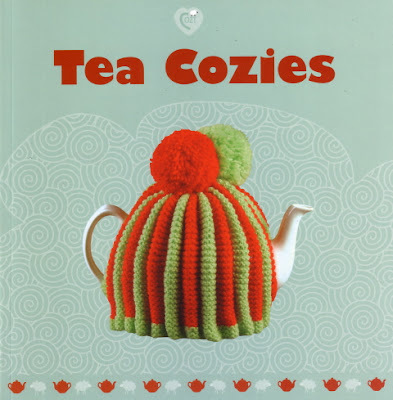 I had read that it had patterns for both crocheted and knitted tea cozies. 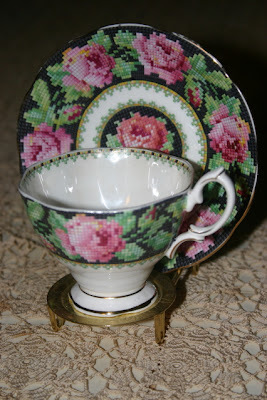 Alas, only one of the tea cozies is actually crocheted, although many of the knitted cozies have crocheted accents. I have been crocheting for about 35 years now (thank you, Grandmother Doris), but I do wish she'd known how to knit as well. I've been knitting for only about 6 or 7 years and can turn out a mean dishcloth, but now I'm ready to try a simple tea cozy. 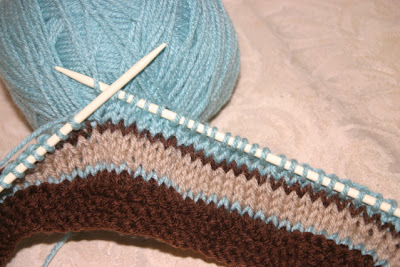 The tan/brown/blue colors up top were the first yarns I came across and have potential, I think. If I can take my knitting up a few notches, I'd really love to make the book's tea cozy with a teacup pattern knitted in, and there's also an adorable sunflower tea cozy, a tea cozy topped with roses (gotta have it), and a tea cozy fox surrounded by dimensional foxgloves. Because this book was originally published in the UK I find that some of the knitting terms are slightly different, and I need to do a little Googling to see what yarns in the U.S. are comparable to the ones listed here. This is a lovely and inspiring book, and those of you fortunate enough to possess some real knitting skills will certainly want a copy of your own. The good news is, my Thanksgiving Day coconut cake with lemon cream filling turned out great! (Thank you, Southern Living.) The bad news is, my weekend attempt at making Madeleines, those classic, scallop-shaped teatime treats, was another colossal failure. The good news is, during the six or seven hours total I spent with the Madeleines -- it takes a while to butter a pan and freeze it three times before baking -- I had time to read and absorb the great new book "Cookie Craft" by Valerie Peterson and Janice Fryer. Most of us who bake have our specialties. I'm good with cakes and bar cookies, not so good with pies and sugar cookies. I predict this is going to change. All my baking life I have dreamed of making delicious and perfectly formed sugar cookies perfectly decorated with royal icing. My cookies have almost always spread, and decor-wise, I never had much success with anything but colored sugar sprinkles. 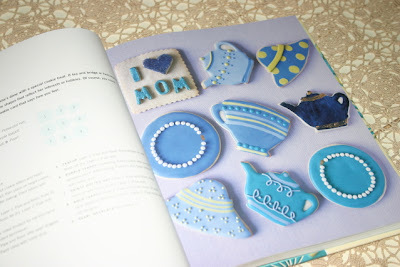 Thanks to "Cookie Craft," visions of teacup- and teapot-shaped sugar cookies are now dancing in my head. Wouldn't these be cute in red and green as Christmas gifts? 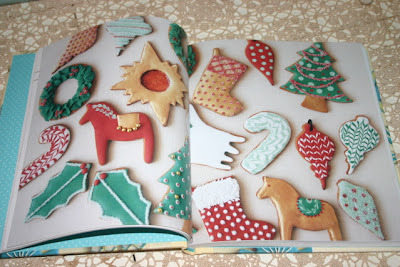 And speaking of Christmas, aren't their Christmas cookies just gorgeous? 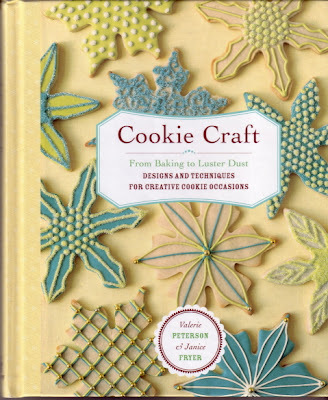 Reading this book was a lot of fun, because it told me about some cookie-baking tricks I'd never heard of before, and the authors kindly share some of the mistakes they've made over the years. (One baked candy corn to represent "tailfeathers" on a turkey-shaped sugar cookie, and the candies basically exploded.) There are four basic sugar cookie recipes the authors recommend, and they include a helpful list of needed (and blessedly inexpensive) items for baking the cookies, as well as a list of resources for finding specialty items and hundreds of new cookie cutters. I still want to master the Madeleine (I'm now convinced I began with a bum recipe), but next up: the sugar cookie! This afternoon, I was sitting in my living room visiting with family members in town for Thanksgiving. The postal carrier drove up, and someone asked if I was expecting a package. "Always," I said. But I knew this one was probably from Marmalady's, and it was. So I am now enjoying a quiet afternoon tea break consisting of a cup of Earl Grey tea and a hot buttered biscuit topped with Earl Grey Jelly. 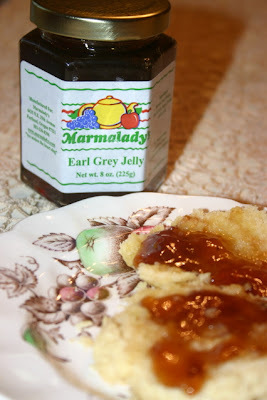 It's delicious, and I can truly taste the Earl Grey tea in the jelly. 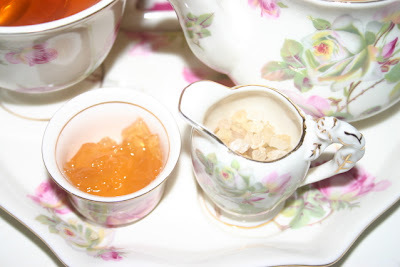 I ordered a few goodies from Marmalady's as Christmas gifts, but the Earl Grey was for me. Once again, I am more than a little pleased with the service and packaging from this company. 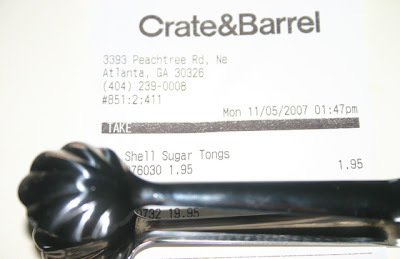 I also appreciated the enclosed card which listed suggestions for using the company's products, such as making "Thumbprint cookies" with some of the tea jelly. It dawns on me that while much of the country was out shopping today, the shopping came to me, and that's how I prefer it. Much as I enjoy the "hunt" for a good bargain, doing so the day after Thanksgiving is just not my cup of tea. 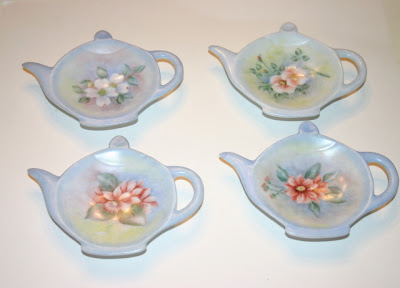 I may have to visit a few stores to finish up my Christmas shopping, but since many of my friends like tea I can do much of my shopping in antique stores and online. Let others fight over 5 a.m. "doorbusters" and parking spaces. I'll take a quiet afternoon spent at home enjoying the delightful flavor of Earl Grey tea. 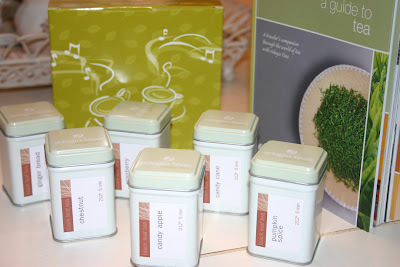 Last week I ordered the Holiday Sampler from Adagio Teas (adagio.com), and two days later I had new teas to try just in time for Thanksgiving guests. (Actually, they are "post-Thanksgiving guests," since I'll be at my sweet sister's house tomorrow and won't be entertaining 'til Friday.) The teas are Candy Apple, Candy Cane, Chestnut, Cranberry, Gingerbread and Pumpkin Spice, and all for $11, which is a great price for these little tins of tea. First, I just have to say that I continue to be impressed by the speedy service from Adagio, Harney, Upton and other tea vendors. I placed my Adagio order on Thursday and had it in hand by Saturday. I actually never planned on having it in time for Thanksgiving, but a nice courtesy e-mail informed me the package was on its way the day I ordered. And for just $3.75 shipping. That's only slightly more than a gallon of gas! So far, I've sampled half of the six teas. The Candy Apple and Cranberry were OK, but just OK. (Harney's Cranberry Autumn is my gold standard when it comes to cranberry teas.) But the Candy Cane tea? Now THAT'S another story! Ohhh, this tea is good! It's not a plain old peppermint tea, definitely not. You know that soft, taffy-like peppermint candy Brach's has at Christmas, the wrapped candies with the Christmas tree design in the middle? 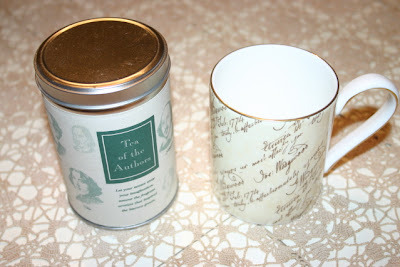 When I first bite into a piece of it I get a hint of buttery richness along with the peppermint, and that's the taste I get with this thoroughly delicious tea. I also ordered a copy of Adagio's guide to tea, and after I've read the book I'll try to post a review of that as well. "The soothing aroma of rich, citrus infused Earl Grey and the glowing scent of wild flower honey nectar." That's the description for the new Yankee Candle Company Tea and Honey candle I got at the local Hallmark store the other day. That's such a hazard of Christmas shopping for me, finding something I just *have* to have when I am supposed to be shopping for others. I was buying the Christmas ornaments I give to my nieces each Thanksgiving. Naturally, I had to browse. Naturally, I had to get the cute amber glass pumpkin that is half-price when you buy three cards. 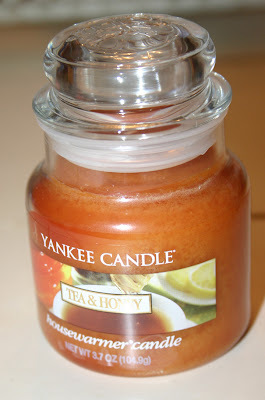 And naturally, I was just delighted to find a Tea and Honey candle without having to actually go into one of the dreaded Yankee Candle Company stores. (I love their products, but the salespeople there pester you to death even when you say "I'd just like to look," so I have learned to stay away in order to avoid sales suffocation.) Thank goodness for online shopping! It dawned on me that some of you readers who don't live in our coverage area (Coweta County, Ga.) might like to see the article we ran about this same church dinner in our magazine last year. Click here to see a PDF file of the Newnan-Coweta Magazine layout from Nov/Dec 2006. Enjoy! Well ... 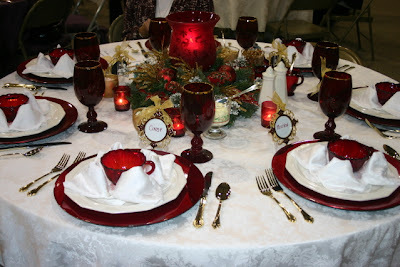 I thought perhaps I was going a little too "off-topic" with the tablesettings (although they DO include teacups), but since some of you appear to be interested, here are a few more pics from my friend's church's Christmas Traditions dinner! 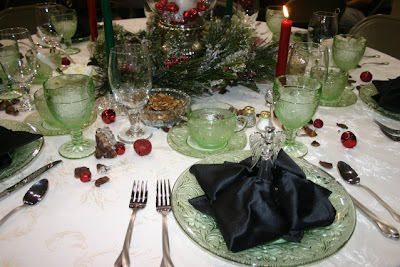 First, a better photo of those pretty Tiara green dishes on the table. (I don't think they were quite through setting up when I snapped these, thus the place card holders don't have the placecards in them yet.) Still, you can see a little more detail. 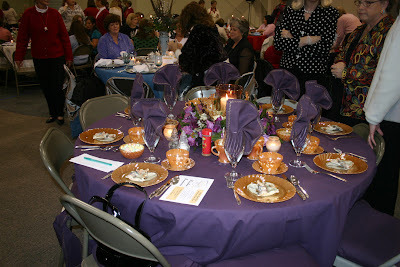 And look at this table ... even the chairs are costumed just for the event! 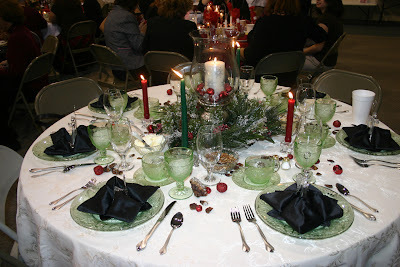 The Christmas Traditions dinner at my friend Ashly's church on Saturday night was as beautiful as always, and I enjoyed it even more than usual because my friend Kathy was the guest speaker this year. 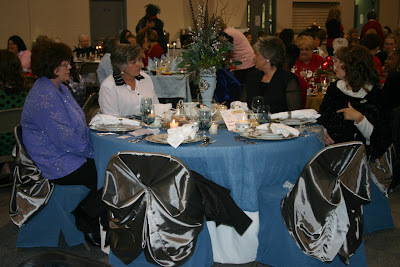 And since we had a little interest in the event on this blog, I thought I'd post some photos. 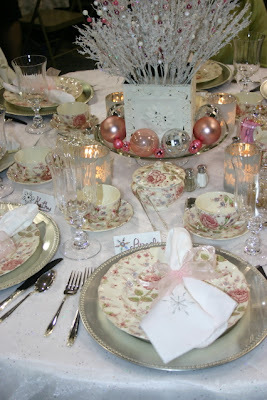 See how pretty my old Johnson Brothers dishes look with Ashly's silver chargers, organza ribbon, crystal and flatware? I wouldn't have ever thought of trying to dress these up, but I think the result is absolutely gorgeous. Here's a close-up of my own place setting. And this pretty, very traditional Christmas decor, which looks like a table setting I might recreate using my Spoke Christmas tree wares. I got a lovely treat bag for coming to the dinner, but the real treat is always seeing the great table settings so lovingly created each year to kick off the holidays. Let them begin! One of the prettiest sights in the world was waiting by the front door when I got home last night: a blue and white USPS Priority Mail box. Thank you, postal service, and thank you, nice eBay seller in Maryland. 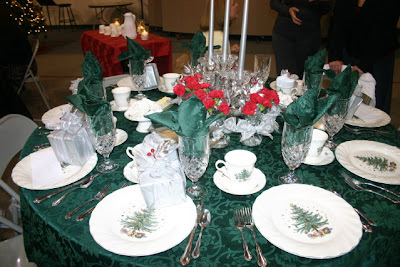 You see, weeks ago my friend Ashly mentioned she was getting ready for her church's annual Christmas Traditions dinner, one of these fancy affairs where women each decorate a table with their prettiest china and Christmas decorations. Their friends are invited to come enjoy a meal (prepared by men of the church) and hear an inspirational speaker to get them in the holiday mood. 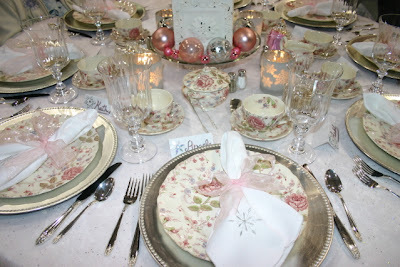 I've been a guest at her table many times, and because Ashly is such a talented stylist (she also happens to be my favorite shopping partner), I've seen her table decorated with many different china patterns. This year, she wanted to go pink and figured I probably had some dishes she could borrow. 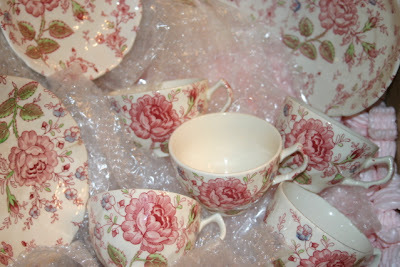 Certainly, I said, and e-mailed her a picture of some of the Johnson Brothers Rose Chintz stuff I've collected. Last week, having finished a major deadline project at work, it suddenly dawned on me that I never told Ashly I had only four cups and saucers! Yikes! I checked and found she needed eight, but I'd seen them at lots of T.J. Maxx stores in recent weeks and didn't see a problem. Then, I began power shopping. T.J. #1? None. T.J. #2? None. #3, #4? None. I was starting to panic. Good old eBay had a set of five ending last Saturday, but could they get here in time? The seller assured me she would post them first thing Monday morning if I won. (The good news is, they were only $9.99, which is even cheaper than I would have gotten them at T.J. Maxx.) The bad news: Monday was a federal holiday, and I was getting a teensy-weensy bit worried. So when I got home last night, ripped open the package, and saw that these cups and saucers had safely arrived, I finally began to relax. I'll drop the dishes off with Ashly today, go to the dinner tomorrow night, and enjoy seeing what my stylish friend has done with these Goodwill (and eBay, and T.J. Maxx) finds! "Faith for your journey" is the motto of the new Life:Beautiful magazine, and I really enjoyed the premier issue I recently received. (Thank you, Grey Dog Media.) The magazine's columnists include some of the Christian writers I've most enjoyed reading over the years, particularly Gary Smalley, Janet Parshall and Ellie Kay. (Somehow, I feel I can trust financial advice from Kay, a mother of seven.) The overall look of the magazine is quite clean and simple and soothing, and I suspect this is a book that knows its audience well, offering up a nice mix of how-to and feature articles, columnists and recipes. The photography and design of this new publication is just terrific. I'm already looking forward to seeing the next issue, which will be coming to Jo-Ann crafts stores and bookstores in my area. 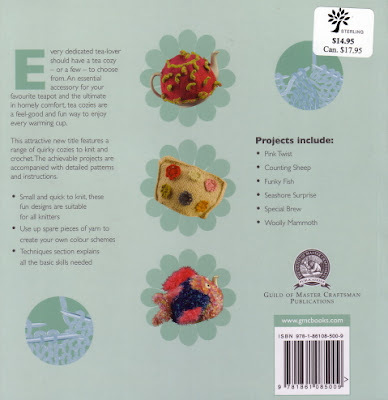 Do any of you remember a Meredith Publications special issue that appeared last year called Lily? 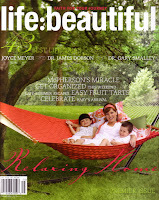 Its editor, Wanda J. Ventling, is now editor of Life:Beautiful. 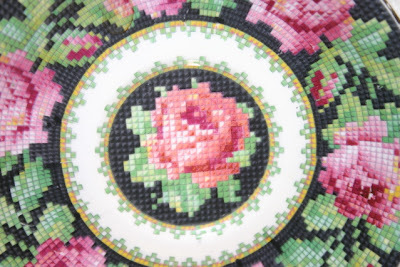 One of the articles I most enjoyed in her inaugural issue of this magazine was "Painted Vessels" by Julie Martens, which tells about a great-grandmother named Ellisene Kuchan and the china pieces she has painted for her family. 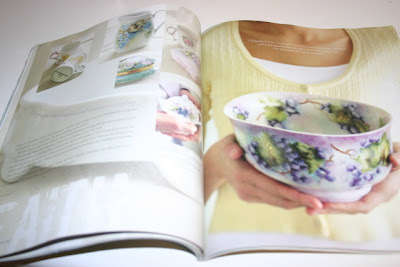 They are just gorgeous, and the layout of this piece was dreamy (other pages inside show bottles of paint and color swatches). 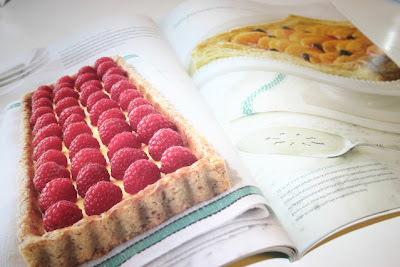 I thought the food styling and photography in the issue was good as well. Don't you want to make this raspberry tart? It has a pecan pastry crust and sounds delicious. "Like an Argentine cowboy ..."
Remember the old song "Rhinestone Cowboy"? I've been trying to make "Argentine cowboy" fit that tune, now that my sweet husband is the happy owner of a mate gourd and bombilla. I'd been wanting to try one of these sets forever, but, well, they're just not very pretty, are they? Interesting, to be sure, but I just couldn't see the Argentine cowboy's drinking vessel and metal straw sitting alongside all my English bone china teacups. 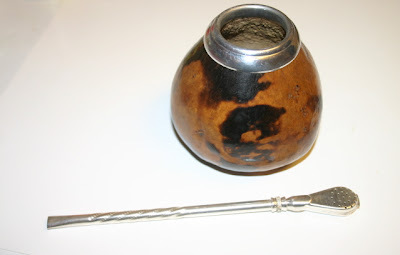 Then one day, my husband happened to mention that he thought it might be kind of cool to drink mate, an herbal tea, from one of the mate gourds like the cowboys in Argentina. (He'd seen them on National Geographic or something, I think.) Well then! Now I had an excuse to purchase a mate gourd! And so last week, I was buying some tea at Teavana in Atlanta and decided it was time for DH to get his mate gourd and bombilla. I've heard mate described as "the coffee lover's tea," and since my husband is the big coffee drinker in the family, I figured this was a good thing. 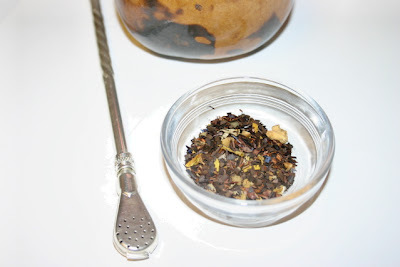 I purchased some mate I had tried at another area tea shop before, tea I made using just a regular tea filter: Mate Vana, which is described as "a deliciously smooth blend of toasted Yerba Mate, almond bits, crushed cocoa beans, cactus blossoms, sunflower and cornflower petals." Only as the store clerk was boxing up my items did she mention I would need to "cure" the gourd, which basically involves letting it soak up water for a day and scraping out any leftover bits of material inside the gourd. The only problem we've found so far is a bit of a leak, but I've read this may solve itself in two or three more days of use. We'll see. But for now, I'm just happy we've added another tea experience (and some new teawares) to this household. The other day I got a fancy new cosmetics catalog in the mail, and I loved looking at all the stuff it offered. There are products geared to each nook and cranny of the middle-aged woman's face, but the one that got me was this tiny little jar of face cream that was $90. Do they know how much $90 will buy? The way I shop, that could get you an entire tea set at a good antique mall, new packages of tea from Harney AND Upton AND Stash, a couple of yards of teapot fabric on eBay, and a tea book or two on half.com. That catalog has found a home in the recycling pile, but I still enjoy checking out the new cosmetics. This week, I needed a new base coat to use with my nail polish, because the old one was getting thick and clunky and producing those dreaded air bubbles in my polish. So, off I went to the local Ulta store. I am not at all brand loyal when it comes to such products, so price was definitely the determining factor. 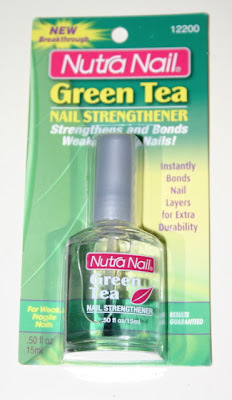 For just $2.79, I found this Nutra Nail Green Tea Nail Strengthener. According to the package, it "combines superpoly-resins with the antioxidants of Green Tea to firmly bond nail layers and fill in weak spots. Nails instantly get maximum strength and the durability to resist damage so they can grow beautifully long and strong at last. (Formulated without dibutyl phthalate to help protect you and the environment.)" All that's great, and I get a kick out of seeing "camellia sinensis" actually listed as an ingredient in this product, but the best news is: no air bubbles in my nail polish. 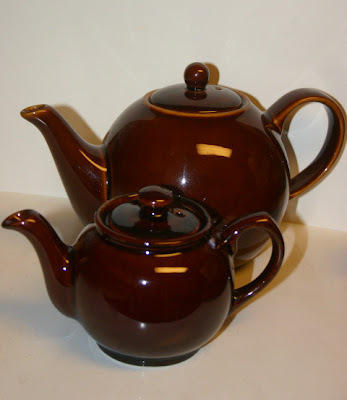 Over the weekend, I made a cup of tea and then a small pot of tea using the new miniature Brown Betty my friend Deberah got for me when she was in Philadelphia a few weeks ago. It came from the Wm. A. Kilian Hardware Co., and I just love this new Baby Betty. When you're preparing a cup of tea, sometimes you know you're going to want another cup, but not a whole huge pot. 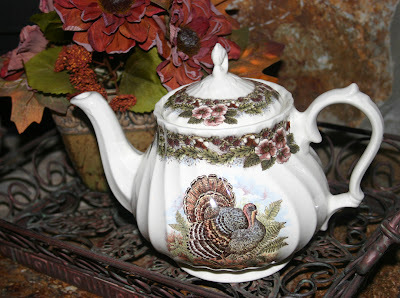 This little 2-cup teapot is just the right size for making a spare cup or so of tea and having it at the ready. When I got ready to use my Baby Betty, I was removing the sticker on the bottom of the pot and saw that it said Made in Malaysia. That Betty certainly gets around, doesn't she! I've been humming the "Do-Re-Mi" song this morning, happy as a lark because this is the first Saturday in forever that I have a completely unstructured day! There's nowhere I have to be, nothing I have to do, no deadline is looming, and my reading list is whatever I want it to be. (Today that includes about a dozen Christmas magazines, a review copy of the curiously controversial book "The Gentle Art of Domesticity" from the UK, and a book I got in Louisiana about the folk artist Clementine Hunter.) 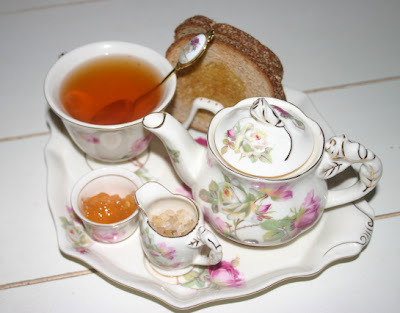 To celebrate the joys of a free day, I prepared tea and toast using this floral breakfast set filled with some of my favorite things. 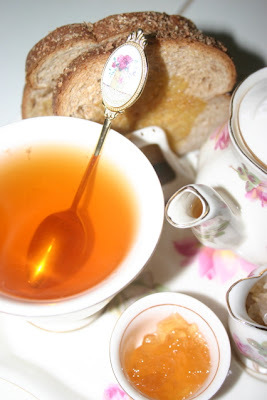 First, I prepared some of that fine Green Rooibos Pear Cream tea I got from Upton. The teaspoon was a gift from my husband during our courting days, and of course he had no idea I was a fan of the particular Sandy Lynam Clough artwork on the handle, but I am. If you are a past or present subscriber to the Tea Experience Digest, you may wish to see my original July 3 post along with some new information about this publication and my experience with it. Thank you. 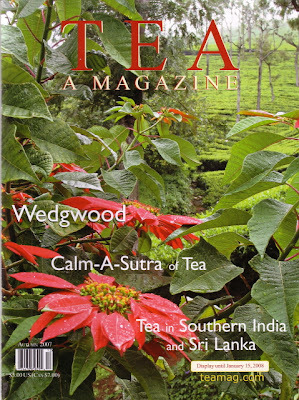 The Autumn 2007 issue of Tea A Magazine has arrived, and there's so much to recommend in this one. First of all, did you notice the flowers on the cover? Editor Pearl Dexter was in southern India to visit the Glendale Estate in Nilgiri, and it was there that this shot was taken, of poinsettia trees set against the backdrop of tea fields. Had you ever thought of these two plants as growing side by side? I had not. If you're a Wedgwood fan, you'll want to read about taking tea at the British Embassy in Washington, D.C. 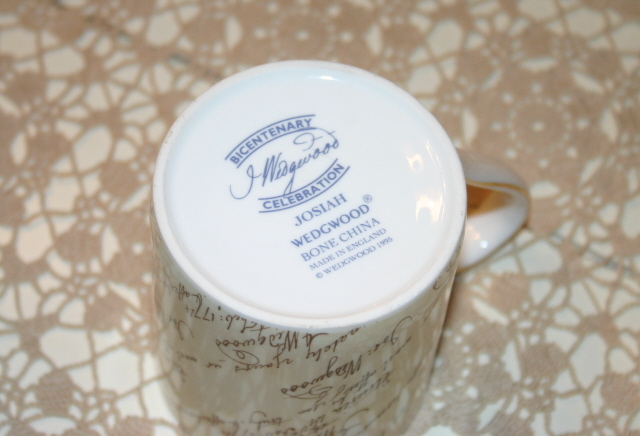 The tea was in honor of the Wedgwood Society of Washington, D.C. 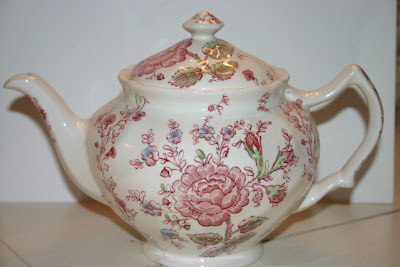 I enjoyed reading about the tea as well as its namesake teaware. There's a lovely, full-page photo of some gorgeous blue and yellow Jasperware teacups and saucers. There are articles on the latest research on tea and health, a feature about humanitarian work by the author of "Three Cups of Tea," a tea crossword puzzle, the usual book and tea room reviews, and much more. I always feel I've gotten my money's worth when reading this magazine, and I appreciate their efforts to take us around the world with tea. 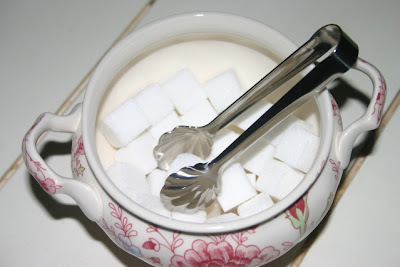 Ever since I set up that "tea bar" on my desk at the office, I've been meaning to add some inexpensive sugar tongs since my poor co-workers have been forced to dig out sugar cubes with a teaspoon. I've got some nice vintage tongs I use at home, but I just wasn't willing to invest much money in something that may very well get buried under a pile of magazines and proof pages when deadline time rolls around and my desk falls into disarray. On Monday, I was at Lenox with my friend Liz killing time between events. She wanted to go in Crate & Barrel if I didn't mind. And hey, I'll shop anywhere, plus it dawned on me they might have some teawares. They did, but it was mostly the modern, white and glass type of teawares that are fine for the young hipster, but not really my taste. She was looking at coffee mugs when I started browsing the bins of cheapie gadgets. And there they were! The perfect office sugar tongs! They're just 4 inches long, a simple scallop shape, and as Bob Barker used to say, the price was right. Office problem solved. Oh, happy day! The Shabby Chic store has finally opened at Lenox Mall in Atlanta, and since I was there Monday I stopped by and was immediately smitten by the lovely, lovely job they have done on this store. Several years ago my friend Sandra graciously taped Rachel's TV shows for me (I couldn't get them at the time), and I have watched those things 'til I have memorized Rachel's topics and tips. Her simple, clean, light-filled decor greatly appeals to me. In her lovely British accent she made tea a regular topic on her shows (it's featured in her books as well), and I wondered if the new store would carry any tabletop pieces related to tea. Indeed yes! They have pretty pink and clear glass plates, glasses and tidbit trays, but the piece that caught my eye on Monday was this sweet little (4-inch tall) Moroccan tea glass. 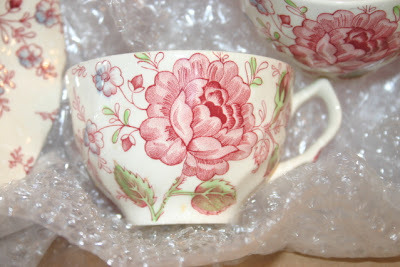 I had always wondered: Can you really drink tea out of these things? Doesn't the glass get too hot? I made a glass of chai in my tea glass, and by the time it cooled to the point I like to drink it, the glass was perfectly fine to the touch. And I love knowing it's a Shabby Chic glass! (FYI: I googled and learned that the Moroccans would actually be drinking green tea, but oh well. We have to start somewhere.) 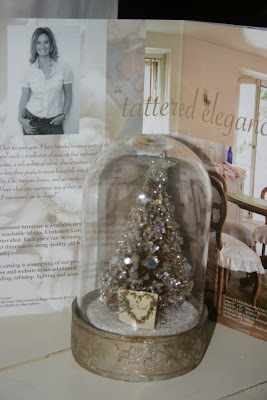 My other find was a 6-1/2-inch tall bottlebrush Christmas tree under a glass dome. Very Shabby Chic, no? It was also fun to discover that Abby, who was working the front of the store, is a Newnanite whom I'd met while writing a story about her historic home some years ago. Then, I learned the store manager, Tiffany, used to live in Newnan as well. Would I like for them to call me when Rachel pays a visit to the Atlanta store (for which she personally selects some of the decor, by the way)? YES! 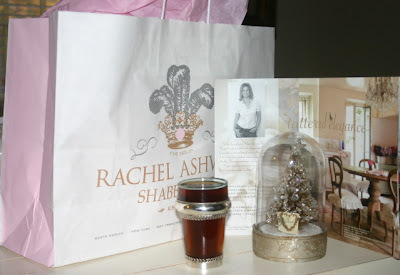 And if the welcoming committee wants a hand preparing tea for Rachel, I am so there! An Interview with Jan Karon! Mitford fans, you know how Cynthia and Father Tim are always sharing a pot of tea? I just KNEW this means Jan is a major tea fan, and I wanted to know what kinds/brands of tea she and they drink. I read of one pot being Earl Grey, but what about her characters' other favorites? Jan told me she has no idea! While she likes the idea of tea and drinks it sometimes "for medicinal purposes," it's daughter Candace who is the real tea fan. (Candace likes green tea, and she and her mother have taken to drinking rooibos together, she tells me.) I'll be writing about our visit with Jan for the January/February issue of the magazine, and Liz will be writing online at the Book Nook, but of course the tea news from this day absolutely could not wait. 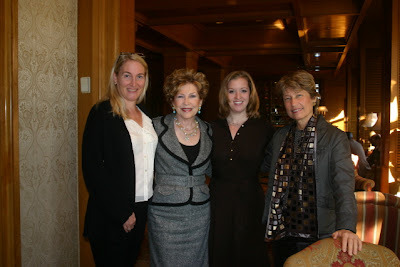 These women were incredibly lovely, and we were all swapping hugs before we left. 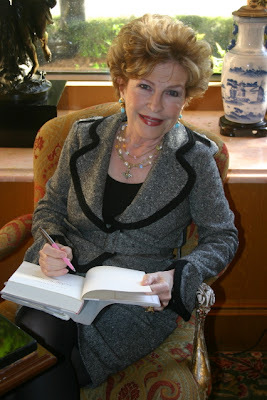 Jan signed our books for us, and -- get this -- she said she will make it a point to think about the tea when she writes about Father Tim and Cynthia's trip to Ireland in her next book. Having recently finished "Holly Springs" (more surprises than you can imagine), I'm now eager to read the next of these Father Tim novels! The publications from Stampington and Company are by far the most inspirational ones I pick up each month. While other magazines give you a set of specific how-to instructions, Stampington's designs are more likely to offer why-to instructions. "Make this design because it will be fun. It will let you be creative. It will let your art flourish." 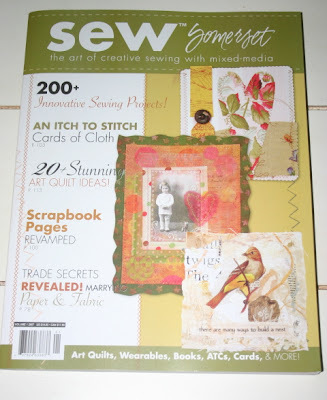 When I heard they were coming out with a new title, Sew Somerset, I couldn't wait to see it. For one thing, like some of you craftier tea lovers, I already have all of these supplies on hand: cardstock, rubber stamps, a few ink pads, fabrics, a sewing machine. 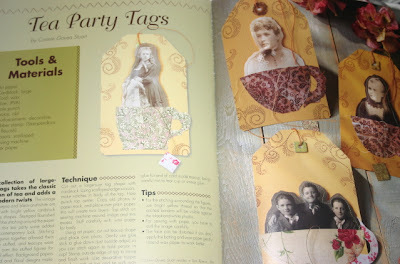 These Tea Party Tags by Connie Govea Stuart are quite clever, I think. I've got a few old family photos I want to use to create tags like these. What will I use them for? Gift tags, of course. Inserts in cards to fellow tea lovers. Bookmarks. Anyone else want to share an idea for what to do with these tags?